A version of this article appears in the May/June 2012 issue of Home Energy Magazine. A large portion of my work as a project manager at Wisconsin Energy Conservation Corporation (WECC) is teaching weatherization workers the dynamics of energy movement in buildings, how to measure it, treat houses effectively, and, in the process, develop a deep understanding of their profession. I want to impart knowledge and enthusiasm to the next wave of weatherizers and energy auditors. This is my role in a larger movement to foster the emerging retrofit industry and help empower people who live in homes and apartments to reduce needless waste of our precious resources. In this article I want to share some of my knowledge about insulating walls. Building science tells us that thermal barriers (insulation) must be coupled with air barriers in order to achieve optimal performance. Insulation injected into enclosed wall cavities with no dedicated air barriers must do double duty: air seal as well as insulate. Installing loose-fill insulation to dense-pack standards does insulate and air seal. The home energy retrofit industry has adopted the—dense-pack— method as the only dependable technique to insulate enclosed wall and framing cavities. There are circumstances that preclude dense-pack cellulose, but with the advent of fiberglass as a viable alternative, all enclosed cavities can be air sealed as a by-product of insulating them. Recent changes in the formulation of the fiber size in loose-fill fiberglass have made its performance as good as, if not better than, that of cellulose (see Table 1). Fiberglass costs approximately 50% more than cellulose per installed volume (regional differences exist). But it takes less time to install, so that cost difference is offset by decreased labor costs. When purchasing a fiberglass product, make sure to specify bags with the correct formulation for the dense-pack method. Note in Table 1 that cellulose is installed between 60% and 105% heavier than fiberglass. It is difficult to install cellulose above 4.5 lb/ft3, but it is very easy to overpack fiberglass. Great care must be taken to configure your machine settings for each type of material and job condition, and be sure to train installers on proper technique. Those of us who have blown cellulose for many years are used to packing it very tight, even supertight: 4–4.5 lb/ft3. Turn up the blower to full air; run the injection tube until it stops; pull it back; push it back up the cavity; and so on. Many of us are familiar with this process: when you can't push the tube into the cavity any farther, the wall is dense packed. With the single-blower pass-through machines, it was all we could do to obtain the necessary density, and the old air-lock systems were hardly up to the task either. 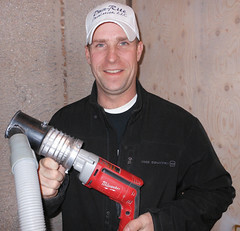 Most contractors are now employing the new generation of double-blower and high-capacity single-blower machines capable of high-production cellulose wall insulation. Fiberglass is entirely different. The dense-pack standard for fiberglass is approximately 2.2 lb/ft3, far less than that for cellulose. If the fiberglass is not properly installed, it is very easy to over compress the fibers. The R-value increases with density, but time and material costs skyrocket. 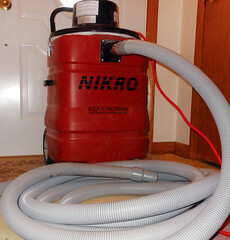 In order to achieve the optimum R-value at reasonable costs, you must know how to set up the machine properly, have enough hose to condition the material, and use a technique that relies on finesse over force. Oddly enough, you can pull that old air-lock tub off the rack and blow fiberglass quite nicely with it—the required pressure is that much less. But for that very reason, larger, modern blowing machines must be ramped down and carefully configured to meet the reduced density criteria. You need reliable electricity. That means a generator sized for initial surge and maximum load. But a generator like that is expensive and requires upkeep. 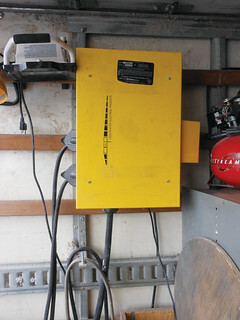 A less expensive option is the portable power distribution unit disconnect box, manufactured by Construction Electrical Products, which plugs into any 240V outlet in the house (see photo of disconnect box, right). Of course, the house has to have 240V service, and if you have to pull it from the range, better be sure the owner doesn't want to cook that day! I advise you not to plug into household outlets without testing for voltage, because the full rated voltage is not guaranteed. Use at least 10-gauge cords from the machine to the power source. Air-lock machines are the norm, and you need proper seals and paddles to obtain sufficient back pressure. Back pressure generates the "push" that packs the material. The back pressure, rate of material flow, and hose diameter are the three factors that determine installed density. 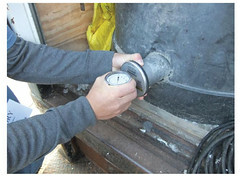 I recommend a minimum of 4 psi as measured by an air pressure gauge for dense-pack cellulose installation. Less is required for fiberglass—approximately 2.5 psi. This is higher than some professionals indicate, but this higher pressure will be required to make up for hose length, height the insulation is being lifted, and weather conditions. Large, double-blower machines can easily achieve this back pressure; single-blower machines may need to be upgraded. Check with the manufacturer—they all have blowers to upgrade their machines for dense packing. To achieve the rated density, you must determine the proper ratio of material to air pressure (material-air ratio). This ratio depends on the type of cavity to be filled. There are three different types of cavity that are filled using the dense-pack method. First are empty wall cavities, 3–4 inches deep, and 16–24 inches on center (OC). The second are partially filled wall cavities. These cavities may contain settled loose fill, they may be back-plastered, or they may contain half-batts or other oddities. The third are large framing cavities that you have identified as critical junctions. These junctions include dropped soffits, bulkheads, tub surrounds, band joists, and so on. Each of these cavities requires a different material-air ratio to achieve the best results, that is, a different blower speed and a different-sized opening of the material gate in order to obtain optimum density and complete coverage in the shortest amount of time. Couple this with different-diameter blowing tubes, and you have much to sort through. I recommend using a wall density check box to take the guesswork out of choosing the right settings. Using the check box allows you to dial in the ratios at the shop, before you go to the customer's house. Use a sidewall-blowing box for standard sidewall cavities or a cavity-blowing box for other areas. The sidewall-blowing box is 2 feet x 4 feet x 3½ inches, for a total of 2 cubic feet of space (see photo of wall density check box, above). The cavity density check box is 2 feet x 4 feet x 5½ inches, for a total of 3 cubic feet of space. The cavity-blowing box is used to find the right setting for 2-inch- and 3-inch-diameter hoses for filling larger cavities, such as band joists, dropped soffits, floored attics, slant walls, and so on. Empty hopper of all material and open feed gate 1 inch. Remove hose from blower outlet. Clamp or hold pressure gauge over outlet. Energize blower(s) to maximum rpm. Continue to run blower with outlet capped by pressure gauge. Click agitator on and off to obtain readings from all chambers. Run blower and agitator simultaneously. Obtain average psi rating for machine. It should be relatively constant and at or over 4 psi. If there are pressure drops, seals need replacing. Fill hopper to a level that can reasonably be maintained throughout the blowing process and set gate to opening size that you estimate will achieve density. Weigh blowing box and then fill; keep track of the time it takes. Weigh again. Box should weight approximately 4.4 lb or 7–9 lb more, depending on insulation used. TIP: To check the integrity of the hoses, you can repeat the above test by measuring pressures at the termination of the injection tube. There should be no drop in pressure. Open the box and feel inside. Pay particular attention to the corners. This helps you refine your technique for addressing corners in walls you are insulating. Corners will always be less dense than other cavity areas unless you actively target them. You can tactilely sense what dense pack feels like in the blowing box, and you can tell what under- and overdensities feel like. You can repeat this test until you achieve the proper density. Do not recycle the fiberglass at all, or cellulose more than twice, since it gets conditioned and will not produce accurate testing results. Save it for a future job. As material in the hopper starts to run out, the air-material ratio decreases, which reduces production and increases the density. So keep the hopper filled, especially as you perform density checks. The best configuration for properly conditioning cellulose is a 50-foot, 3-inch-diameter hose; then a metal diameter reducer; a 25-foot, 2½-inch-diameter hose; a metal diameter reducer; a 50-foot, 2-inch-diameter hose; a cone reducer cut at 15/8-inch inner diameter; and finally a splayed-end injection tube with a 15/8-inch inner diameter and a 45º cut at the end. Here are some more tips for setting up insulation equipment. Use heavy-duty hose clamps, such as the T-strap style. If necessary, saw off the extra threads and wrap a few rounds of duct tape to protect against snagging as hoses are moved across surfaces. Rotary agitators do not completely condition fiberglass, so you must run 100 feet of ribbed 2-inch hose to break up the material. The narrow diameter tumbles the glass fibers and pills the product—a necessary condition to allow smooth installation and to achieve proper performance. Never run 100 feet of 3-inch-diameter hose that terminates in a 1½-inch injection tube in the span of only 1 foot. Unfortunately, I see this all the time. This setup is too heavy and dangerous for the average person to use while on a ladder, and it practically guarantees that the hose will plug up during wall cavity insulation. Never drill through any cladding unless the house is to be re-sided or the owner is fully aware, and the drainage plane can remain intact. Care must be taken to remove and replace siding, using industry best practices. Here is my method; but I warn you, it's not for everyone. I take a 2¼-inch hole saw and remove the pilot bit. This allows me to drill a minimal amount of sheathing material and remove debris easily. Practice this technique; since there is no pilot, the bit will skip across the wall at first. A lightweight, high-speed ½-inch drill works very well here. Angle up and angle down when drilling. This produces an oblong hole with inwardly tapered edges, significantly easing insertion of the injection tube. But you cannot use a plug to seal the hole; you have to use alternative methods to seal it after installing the insulation. 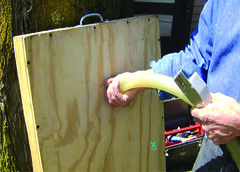 This method works best when you must drill through multiple thicknesses of siding. Experienced technicians can actually use a larger-diameter hose when the access cavity is angled in this manner. When insulating true balloon-framed houses, peel off the siding at the band joist to gain access to the first and second floors and to fill the floor-line cavity. It's nice to stay away from ground plantings along the house whenever possible. Three problems arise when you work from the band joist. First, you may not be able to slide the hose down or up the cavities because the hole is drilled into open space. In this case, there is no interior wall to push the tube against. You can drill or saw a long oblong slot to reduce the angle of insertion, or drill one hole at the bottom of the second floor and one at the top of the first-floor wall. Second, builders allow subfloor and lath strips to carry into the wall cavity, and this creates a second problem. There is no real reason not to allow the lath strips to carry over, but it does have the unintended consequence of making it impossible for the hose to get past these obstructions when you are insulating. Third, the band joist cavity must be filled when walls are blown, but there is no way to do this in platform construction unless the band is opened. The exposed cavity has no backing; it is completely open from one end of the house to the other. A large amount of insulation will be installed here if there is no way to stop its flow deep into the cavity. This is where I use the "bagging method" to create a plug by placing a sufficiently sized mesh bag in the band joist cavity. Fill it with blown-in insulation, taking care to probe the corners, stuff the bag tail into the cavity, and top it off. This "marries" the top floor to the bottom-floor insulation, completing the thermal envelope. On exterior walls, only one hole per unobstructed stud bay per floor is required. The injection tube travels up and down the entire cavity, making a second hole unnecessary. Of course, blocks and fire stops may isolate sections of a cavity, each of which must be accessed and filled separately. I do not use a tape measure, boroscope, or other probe to determine blockages in stud cavities. Nor do I do any exploring before filling; I use my injection tube to locate blocks within each cavity. To be sure that the insulation reaches the top plate, subtract 6 inches for every 4 feet of run if your hose is snaky. Probe side to side during the fill process. Don't waste time drilling a hole, probing, drilling, and so on. Drill every 16 inches and let the technician filling the holes do the probing. Immediately drill any missed cavities. When conditions permit, pull out the most expensive stud finder in the world, your infrared (IR) camera, and scan the walls to locate framing patterns from the interior and transfer that information to the exterior wall. Some siding types cannot or should not be disturbed and some cavities cannot be accessed from the exterior, so an alternative to exterior insulation installation is to fill from the interior. Lead-safe rules and practices come into play and must be rigorously practiced. You know the rules, so follow 'em! Use an IR camera to locate studs. Place the holes low, below the sight line, and behind furnishings—circular holes only. The wall is thin, so tubing works easily. Bring and wear knee pads! Use quick-release support poles to tent areas. Isolate the bare-minimum widths. Use duct mask, not painters tape, to adhere to plastic. Cut 2–3-inch widths directly from a roll, like you'd slice a cake roll. Use capture tools to eliminate dust (see photos at left). This is the single most effective method to protect you and the building occupants from the spread of lead dust. For example, drill a 1-inch hole in a sponge and slide it over the injection tube. Cover the drilled hole as the wall is being filled. Depressurize isolated areas to reduce dusting and to compensate for air introduced by the insulation machine, which tends to distribute dust. Stuff loose wads of fiberglass in unblown holes to filter expelled air. Clean areas immediately upon completion. Place tack mats to collect dust. Here are some ways to do the job right and not take too much time doing it. 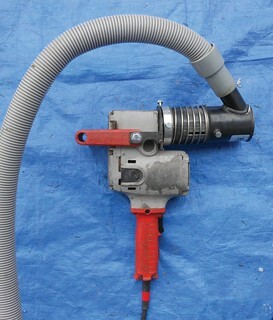 When you are working with existing wall insulation, you must reconfigure the blowing machine. Use a lower material-air ratio—which translates into a stronger force—to displace old loose fill that may have settled or have been tunneled by rodents. It takes a strong pressure to push that material aside; think of the density of old rock wool versus newer fiberglass products. In order to get the tube up the wall, it may be necessary to run the blower-only setting, using the airstream to displace existing insulation as you slide the tube up the wall. Keep Your Hand on the Switch! The material-air ratio is critical to achieving proper density. You should never run the hopper independently. The air-lock system on most machines allows a predetermined volume of semi-conditioned material to drop into one of six air-lock chambers. As the chamber rotates to the bottom, the blower propels the insulation into and through the hose and completes the conditioning. This ratio of air to material can be altered in many ways, each of which affects production and performance. The most common problem is to allow the agitator to run without the blower operational. This fills the air-lock chambers with too much insulation, which clogs the narrow-diameter injection tubes. Save yourself huge headaches and manifold apologies by conducting an exhaustive inspection of all interior surfaces before blowing cavities. This is very invasive process and should be done only when the homeowner is present or has granted you permission to do it. Document all existing conditions and damaged building components, and draw footprints of walls and floors to assure complete coverage. 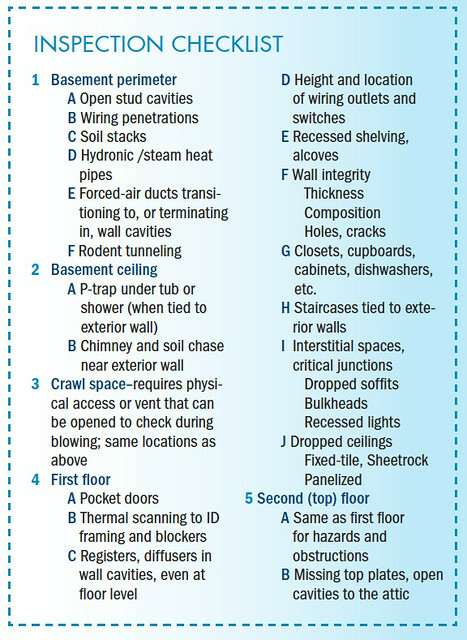 See "Inspection Checklist" for a list of important areas to include in your inspection. TIP: The auditor or salesperson must be able to identify these spaces and build them into the quote. A lot of insulation and profit can disappear in a band joist cavity or cupboard soffits. Enclosed wall cavities are one thing, but even the simplest ranch homes contain areas that require a new skill set, and rethinking and customization of the insulation process, especially when dense packing is required. We call these areas critical junctions—inaccessible interstitial spaces where wall, ceiling, and upper floor assemblies intersect. They waste energy, both conductive and convective, and the best, and sometimes only, way to address them is to fill them completely. Tub surrounds on exterior walls represent one kind of critical junction. If the wall cavities and tub surround communicate with each other, I will take measures to isolate the plumbing access panel and pipes from any loose fill, and then blow all cavities with fiberglass. I never want cellulose near plumbing or masonry. This will keep the walls warm (and extend the life of a hot soak in the tub). If I choose not to do this, either I have a large area of uninsulated wall that will result in performance issues in the future (condensation on walls, internal-component moisture gain, air leakage) or insulation finds its own course and will fill this area. I'd still use the same amount of insulation, but instead of taking the hit, I would make sure to inform the homeowner and only charge a nominal extra fee in my bid. TIP: Always use the largest-diameter hose/tube possible to fill cavities, and adjust the feed gate accordingly. This generally means it can be opened more, for quicker fill. Good rule of thumb: The greater the back pressure, the more the feed gate can be opened, especially with 2–3-inch-diameter tubing. Pretesting and postmeasuring are the only paths to certainty. Large voids represent another kind of critical junction. These large voids should be prefilled to reduce the time it takes to fill the cavity. Whenever possible, I'll remove the reducer nozzle and injection tube, use the 2–3-inch hosetube with the gate opened, and dump a large amount of insulation quickly. Then I'll go back with the injection tube to probe and completely fill the cavity. Some voids, such as eyebrow roofs, band joists, and end cavities, can be filled with a 2-or 3-inch hose directly. If you have pretested your machine to determine the settings with larger diameter hoses, the adjustments can be made quickly. Use the density check box to dial in your machine for the day. This should be done when any variable changes. These variables include a different product, new hoses, and a change in the weather, among other things. Standard 3½-inch wall cavities take 1 lb of cellulose per square foot of wall area. Thus, a 1,000-ft2 section of wall will use about 1,000 lb, assuming 4 lb per cubic foot density. At 22 lb per bag, this house will need about 45 bags. About 40 bags will be required for 3.5 lb per cubic foot. This calculation assumes no existing insulation or large interstitial spaces or other anomalies that would skew existing volume. This calculation should be done before work proceeds and should be monitored accordingly. Depressurize the house to 50 Pa and use a smoke stick to test holes that have been blown but not plugged. If the insulation is dense packed, by definition no air should be moving into the cavity. Be very careful that you are testing the cavity and not getting air movement across the sheathing, siding, or building paper, as air can travel across and in front of stud cavities to voids in framing members, giving a false reading. To compensate for space in front of the stud walls, use a 2-inch metal coupling, insert it into the filled hole, obtain a positive seal to the insulation, and smoke test inside the coupling. This achieves an accurate test. While blowing one cavity, check the previously filled cavity for air intrusion. Use a 2-inch collar as described above. No air should be exiting the previously filled cavity. Core samples are very accurate, but extremely difficult to obtain. The amount of material measured is so small that even tiny inaccuracies in measuring volume and weight are magnified. Also, it is not easy to pull representative samples, since there are differences in material density even within well-blown cavities. Finally, use coverage calculation charts that take into account windows, door openings, and framing factors. They help plan a job and can be used to calculate installed average density. But be aware. Existing insulation, large voids, and balloon framing can make this method very difficult, if not impossible, to use. Many crews place a wood or foam plug into the hole they have drilled and then seal it with caulk. They do not do this to air seal the walls; that's the purpose of dense packing. That said, if the walls are not properly dense packed and the holes are not air sealed, air leakage in the house will increase alarmingly. I seal the holes (and building paper over the holes) to reestablish the drainage plane. This is explained at greater length below. Following are some tips for the installer who is finishing up an insulation install. Note that the substrates mentioned below are the materials I am drilling through—not the exterior of the wall. Note also that when I am insulating from the outside, I always remove the exterior cladding and replace it after I'm done. First, assume that water will get behind the exterior cladding. If the cladding is vinyl, it will. You must protect the layers of sheathing underneath the cladding by making sure that the drainage plane is intact. Most installers drill circular holes; some of us use the 2¼-inch hole saw method described on page 30. This method creates an oblong hole, which is not suitable for plugging, as I have explained. It must be sealed by other means. I describe both options for sealing oblong holes in the discussion that follows. For substrates such as wood lap siding, use step flashing shingles. These are expensive, but they make the job quick and easy. Slide the shingle under the first uncut course and nail once. If the hole is small enough, cut the shingle in half. If you have a sheer, cut scraps. Ice and water guard also works. Be sure to get a good seal, wipe the dust off, and—I didn't say this—torch it down and use a roller to seal. For slotted holes, use ice and water guard or butyl rubber tape; torch down. Dust from cellulose can interfere with adhesion; clean surfaces thoroughly first. If time and temperature permit, spray one-part foam into the hole. After it skins over, push the overfill into the hole, flattening it. Brush mastic over the patch to create a drainage plane. This is cheap, but it's messy and it doesn't work everywhere. Alternatively, use one-part foam and cover with mastic. This is also tricky, because the plug can pull back as it dries. In both cases, dust from cellulose can prevent adhesion. Use a hole saw to drill plugs from a sheet of foam. Size the plugs to fit the holes. Seal with caulk or mastic. When cutting holes through sheet foam, wipe off insulation dust and seal with 3-inch Tyvek tape, and cover edges with mastic. Or slice long strips of sheet foam, drill holes, and replace the foam. Mastic or tape the strip of foam into place. When an air barrier or tar paper is present, slice it and fold it up. This keeps wood chips from falling behind the paper. Staple the paper back into place when you have finished blowing insulation, and finish with air barrier tape; or use a second strip of the air barrier and flash accordingly. Ranch homes are notorious for exterior wall cavities that open into soffits above cupboards and kitchen sinks. Frequently these soffits contain non-IC recessed lights. Any attempt to insulate these wall cavities from the exterior leads to filling up the soffit, covering the light fixture. The options are few. You can replace the fixture with an IC-rated can or install a surface-mounted light. Or, if you have access to the attic, these cavities can be insulated from the attic side. This will allow you to air seal the can properly. What's the Best Way to Blow Sheetrock Off the Walls or Crack a Lovely Plastered Wall? Here is a list of the common errors or omissions that, alone or in combination, will destroy a lovely Sheetrock or rock lath wall. Please, don't try this on the job! Forget to test for strength, fastening pattern, thickness of material, existing cracks, and damage. Set material-air ratio low, allowing high back pressure, or allow the material level in the hopper to get very low, which has the same effect. Once the injection tube stops dispensing material, back pressure begins to increase. Allow the entire system to achieve maximum pressurization, and then pull the fill tube down. This sends a huge blast of compressed air into the cavity; you can usually hear a distinct pop! Make sure the last cavity you fill is in the middle of a long wall run and is insulated on either side. This doesn't allow for air pressure relief. Drill access holes just big enough to insert a hose, but not big enough to allow air pressure relief. There is both an art and a science to wall insulation. I hope this gives you some instruction, direction, and insight to this very difficult yet cost-effective retrofit measure. This is by no means a complete telling of the tale. Much can be learned by diligent preparations and intelligent observation of your installation procedures. You get one chance, so do it right the first time! I offer my thanks to Jim Fitzgerald and Keith Williams for being my mentors. And I offer a big thank you to Mike Foss, owner of DunRite Insulation, Madison, Wisconsin, who is the most progressive and capable contractor out there. He is always willing to share his innovations with others. policy or position of any agency of the U.S. government.